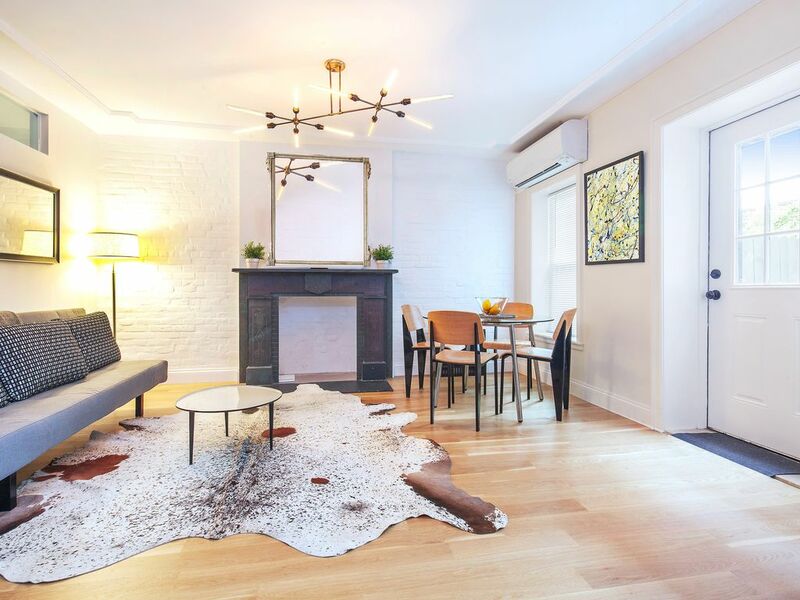 Beautifully renovated Brooklyn Garden Floor 2 bedrooms 2 bathrooms apartment is a great option for somebody who is visiting New York and wants to experience an authentic local experience. The A express train is six minutes walk from the house. It takes you to Downtown Manhattan in 15 minutes. The house is located in one of the most vibrant Brooklyn areas, between the neighborhoods of Bedford-Stuyvesant and Crown Heights. Walk up the stoop to discover a historical gem with the contemporary comfort. This home is all about original details with modern comfort after a complete careful renovation. Wood original door moldings, marble fireplace and original parquet floors, lending the rooms an airy sophistication. The entire building has been fully renovated but keeping all the original details. You will have the convenience of a modern home with central air, brand new kitchen and two bathrooms, but the original architectural details of a Brooklyn townhouse of the early 20th century. The kitchen is fully equipped. Gray countertop with marble backsplash, its window overlooks the garden, with a door to the private terrace. Two bedrooms and two bathrooms are generously spread throughout the home. Each bedroom has a full closet. This home spans over one floor with no lift and a private backyard. This home comfortably sleeps four adults in two bedrooms. See the floor plan in the photographs section. Bedford-Stuyvesant, popularly known as Bed-Stuy (sounds like: Bed-Sty), is located in central Brooklyn and nudges up against ultra-hip Williamsburg. A historic neighborhood that boasts both pristine brownstones and unkempt storefronts, generations-old Bed-Stuy residents share their streets with newcomers and hip kids. Although Bed-Stuy bears an unsavory reputation, its tight-knit community's dedication to their neighborhood continues to support improvements as renovating bars and cafes increasingly join its cadre of locally-owned businesses. Home to many of Brooklyn's museums and boasting the influence of a strong Caribbean community, Crown Heights adds a dash of spice to Brooklyn's varied mix of neighborhoods. Although Crown Heights merits its somewhat seedy, rough and tumble reputation, its wholesome and highly anticipated street carnivals cultivate sincere neighborliness. The neighborhood's small businesses continue to infuse its streets with vigor, as Crown Heights sheds its less-than-glamorous past. The A express train is a six minutes walk from the house. It takes you to Downtown Manhattan in 15 minutes. The C train that takes you to the Brooklyn Academy of Music (BAM) and Fort Greene in less than 10minutes. Just a few minutes away there is a very convenient and well stocked station of Citibike. You can also enjoy a bicycle ride to the nearby Prospect Park or even to Manhattan, over the Manhattan or Brooklyn Bridge. Among the best restaurants in the area: Saraghina, Peaches and SuoerFrench cafe. Bar Lunatico has live music and you can also enjoy some organic supermarkets. One of the most acclaimed restaurants of the area Saraghina, is located at a short walking distance. This restaurant, bakery and wine bar offers a very appreciated Neapolitan pizza from a wood-burning oven served in a rustic setting. With the bus you can go to Park Slope, Fort Greene, Clinton Hill or Williamsburg or Bushwick in 10 to 15 minutes. They say it's the city that never sleeps, so if you are curious about when is happening, here is a list the major events, festivals, holidays, parades and more, organized by month.
. From watching the ball drop in Times Square to the Lunar New Year celebration in Chinatown, though it may be cold in the Big Apple, these events keep things hot! For a more detailed guide to visiting in January, check out this January weather & event overview. February. Romance is in the air with couples flooding the local restaurants on Valentine's Day. February is not the most popular time to visit, out there is still plenty to do in this chilly month, including the fall/winter fashion week presentations. Click here to read the February weather & event guide. The St. Patrick's Day Parade is by far, the most popular March event. Though March can be tricky weather-wise, you could be in for a delightfully mild surprise, but be sure to read this first: March weather & event guide.
. "April showers bring May flowers". This saying is a cliche for a reason: it is almost guaranteed to rain in April, but if you visit later in the month, you'll get a glimpse of the stunning cherry blossoms at the Brooklyn Botanical Gardens, and even get to celebrate our one and only planet on Earth Day. For a more detailed guide to visiting in April, check out this April weather & event overview.
. May has the mildest weather conditions, and it's before the kids are off school, making it an ideal time to visit. The Tribeca Film Festival and Fleet Week are among the popular events this month, and there's much more to discover in the May weather & event guide. June. The Coney Island Mermaid Parade has grown exponentially in the last few years, and definitely worth a visit, as are the many street fairs, outdoor performances, and even horse races. Consult this guide before planning your trip: June weather & event guide. July. Celebrate the sweltering summer by watching the Independence Day fireworks, or catching a live performance or film in one of the many parks. July is a fine time to visit, despite the inevitable heat, and learn more about this month's climate by visiting the July weather & event guide. August. New York is notorious for being empty in August. This is good news for visitors because they can feel like they have the city to themselves. Just because the locals are away, doesn't mean that there isn't a bevy of exciting events happening, and you can learn more about them here: August weather & event guide. September. From the exciting U.S. Open to the spring/summer presentations at New York Fashion Week, September is the month for New Yorkers to go back to work, and resume their daily routines. Click here for more tips for visiting in late summer: September weather & event guide. Two major parades take place in October: The Columbus Day parade and the ghostly fun Halloween Parade. The cool, crisp air is perfect for enjoying this fair city and this guide will help you plan your trip: October weather & event overview. December, check out this helpful overview: December weather & event guide. We are a family who loves living in and experiencing Brooklyn, a vibrant part of Brooklyn, New York. Born in New York, we have traveled extensively and we speak several languages, enough to have a fun conversation: English, Spanish, Italian and French. We recently finished renovating completely this apartment in one of the best neighborhoods in New York! Come stay in our property! We'd love to share this beautiful brownstone with you. You will have total privacy but we will be there to help with anything you need if you ask us. We can't wait to meet you! Home to many of Brooklyn’s museums and boasting the influence of a strong Caribbean community, Crown Heights adds a dash of spice to Brooklyn’s varied mix of neighborhoods. Although Crown Heights merits its somewhat seedy, rough and tumble reputation, its wholesome and highly anticipated street carnivals cultivate sincere neighborliness. The neighborhood's small businesses continue to infuse its streets with vigor, as Crown Heights sheds its less-than-glamorous past. Bedford-Stuyvesant, popularly known as Bed-Stuy (sounds like Bed-Sty), is located in central Brooklyn and nudges up against ultra-hip Williamsburg. A historic neighborhood that boasts both pristine brownstones and unkempt storefronts, generations-old Bed-Stuy residents share their streets with newcomers and hip kids. Although Bed-Stuy bears an unsavory reputation, its tight-knit community's dedication to their neighborhood continues to support improvements as renovating bars and cafes increasingly join its cadre of locally-owned businesses. As Brooklyn's borough-wide gentrification sweeps farther and farther east, it's crystal clear that Crown Heights is under the hazy glow of kale-and-yoga tinted spotlights. Long known for its abundance of West Indian specialties, in recent years the bustling neighborhood has experienced a surge in nouveau New American eateries, a Carob Spring if you will, that's helped solidify its place among the desirable Brooklyn enclaves. Luckily, the old guard stands strong, thanks to still-gentle rents and supportive local clientele, and for now, it seems the community will support both endeavors -- which means more great restaurants for everyone. Getting around The A express train is six minutes walk from the house. It takes you to Downtown Manhattan in 15 minutes. The C train that takes you to the Brookyn Academy of Music (BAM) and Fort Greene in less than 10minutes. Just a few minutes away there is a very convenient and well stocked station of Citibike. You can also enjoy a bicycle ride to the nearby Prospect Park or even to Manhattan, over the Manhattan or Brooklyn Bridge. Among the best restaurants in the area: Saraghina, Peaches and SuoerFrench cafe. Bar Lunatico has live music and you can also enjoy some organic supermarkets. One of the most acclaimed restaurants of the area Saraghina, is located at a short walking distance. This restaurant, bakery and wine bar offers a very appreciated Neapolitan pizza from a wood-burning oven served in a rustic setting. With the bus you can go to Park Slope, Fort Greene, Clinton Hill or Williamsburg or Bushwick in 10 to 15 minutes. Bedford-Stuyvesant, popularly known as Bed-Stuy (sounds like: Bed-Sty), is located in central Brooklyn and nudges up against ultra-hip Williamsburg. A historic neighborhood that boasts both pristine brownstones and unkempt storefronts, generations-old Bed-Stuy residents share their streets with newcomers and hip kids. Although Bed-Stuy bears an unsavory reputation, its tight-knit community's dedication to their neighborhood continues to support improvements as renovating bars and cafes increasingly join its cadre of locally-owned businesses. Home to many of Brooklyn's museums and boasting the influence of a strong Caribbean community, Crown Heights adds a dash of spice to Brooklyn's varied mix of neighborhoods. Although Crown Heights merits its somewhat seedy, rough and tumble reputation, its wholesome and highly anticipated street carnivals cultivate sincere neighborliness. The neighborhood's small businesses continue to infuse its streets with vigor, as Crown Heights sheds its less-than-glamorous past. It is provided linens for the beds. If extra linens are needed must be requested in advance, prior to the arrival. Parking on the street is free and available. Regularly, it is easy to find parking. It is provided one set per guest of hand and bath towels. If extra towels are needed must be requested in advance, prior to the arrival. Smart TV with online channels. Regular open TV as well. No traditional cable, but unlimited Netflix is available for free and all the TV channels are now online available on the Smart TV. Smart TV. No traditional cable, but unlimited Netflix is available for free and all the TV channels are now online available on the Smart TV. Small library with books related to Brooklyn and New York. No traditional cable, but unlimited Netflix is available for free and all the TV channels are now online available on the Smart TV. Private backyard with seating area. It has two steps. Not Wheelchair accessible. Brooklyn done right! Super clean and updated. My family just spent a week in this updated Brooklyn flat and couldn’t be more pleased with the accommodations. Great space, very clean (and my wife is a clean freak and even she was very happy), and awesome owners who let us keep our luggage in the apartment way after checkout so we didn’t have to lug it around on our last day. The apartment is exactly what we saw in the pictures and it was so nice to be on the ground floor after walking NYC all day. There is a great bodega (grocery) less than half a block away- ask for Nawa and tell him Scot from Utah sent you! The C train (subway) is just a few blocks away and it gets you anywhere in NYC that you would want to go quickly. We will definitely stay at this place again the next time we are going to visit my sister in Ny. Highly recommend you stay at this great 2 bedroom 2 bath flat. We had a great time at this beautifully remodeled garden apartment in Brooklyn. The location is close to the subway, the neighbors are friendly, and the corner store has good coffee and fried egg sandwiches if you don't feel like making breakfast. The apartment is loaded with all the amenities we needed, and the owners will provide extra linens and towels if needed (we did get extra towels). The place was immaculately clean. A bottle of wine was waiting for us when we checked in - a very nice touch. The owners were very responsive throughout the booking process, the weeks leading up to our arrival, and while we were at the apartment. We had some last minute changes and the owners were very accommodating. We did quite a bit of sight-seeing during our stay, and it was nice to come home to a comfy apartment to binge a Netflix series and unwind. The beds are comfy, the bed linens were very good quality, and the pillows were really nice. This was a good trip and I would stay here again. Bright and clean accommodation, both beds were very comfortable. It was on a nice quite street, close to subway and grocery store. It was 4 of us two couples and had plenty of room the back yard was a bonus felt like true New York living. Well presented and clean apartment with all the convenience of home. Well located to subways within 10 minutes walk to access Manhattan. Many choices of food within five minutes walk. Would highly recommend. We arrived in the evening, after dark, and we had trouble finding the house due to a barely visible housenumber. When we finally got the lockbox to release the keys, we were mest by at beautiful, light, clean and spaceous apartment. The outdoor garden was a mess and isn't inviting to use, the bed in one of the rooms squeaked so loud that when you turned over in your sleep you woke up. The upstairs tennants stomped around and kept us awake late hours of the night and early hours in the morning - so pray that none is renting the flat above. What we found most frustrating was the facts that no garbage bags were offered, and the owners lay out were strict recycling rules contemplating that they would get in trouble if the garbage was not put in the right bags and recycled properly. None the less... A beautiful place, close to the subway and proper grocery stores. A good experience. - The second half of the payment will be paid in cash upon arrival. *Children's fee after 3 years old. Free until they can sleep in the travel cot. After they need to sleep in a bed or sofa bed they should pay the additional fee.